In the post-1990 era, most Treasury bond bear markets are associated with Fed rate hike cycles. (There have been some counter-trend selloffs, such as the “Taper Tantrum” of 2013.) The 1994 episode was a notorious bear market that persisted throughout the hike cycle, whereas later bear markets tended to be more front-loaded, with losses concentrated before the Fed even starts to hike rates. This is what one would expect in an environment where the Fed is transparent about its policy actions. I want to emphasise that although the base case is that the Fed will hike rates by mid-2015, such an outcome is hardly certain. (What I mean here by “base case” is that it is my reading of the internal consensus at the Fed.) The low level of inflation could allow the Fed to delay rate hikes slightly, such as near the end of the third quarter. Such a delay would be cosmetic. The more significant risks to the base case view are associated with the ongoing agony in the euro area, as well as the collapse in commodities. It is hard to square a hawkish world view with commodity prices hitting new lows on a daily basis, and with the U.S. dollar crushing other currencies in the foreign exchange markets. I would note that I do not think there is any particular inflation risk that warrants tightening policy. Moreover, the weakness outside the United States requires careful monitoring. That said, the markets discount what the Fed thinks, not what I think. I have deliberately began the time axis on the chart at the beginning of this article at 1990. 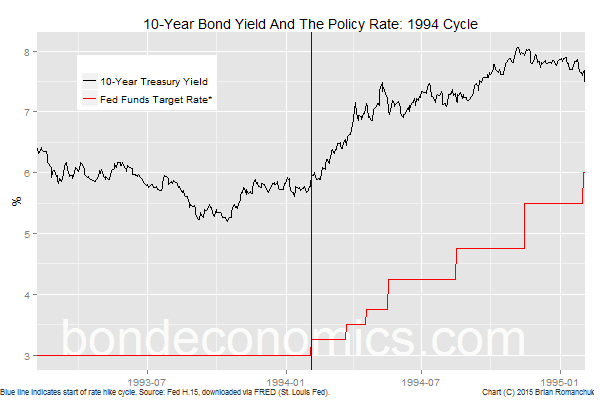 My justification is that earlier eras offer less guidance for the interaction between the policy rate and bond yields. Pre-World War II, the United States was on various forms of the Gold Standard. The regime for interest rates and policy reaction functions was quite distinct. From World War II until the 1970s, interest rates were regulated and so bond market behaviour was quite different than from now. The Bretton Woods system affected policy, although it did not pose a binding constraint on the United States until the near the demise of the system. In the earlier period, the United States had ample gold reserves and could largely ignore the external constraint. During the 1970s and 1980s, financial market behaviour (in the United States at least) was more closer to the present, in that the interest rate complex was deregulated. However, Fed policy was much less transparent, to the point of not announcing what the policy rate was. The flirtation with Monetarism, and its impossible task of targeting money growth, also muddied the waters. There were structural economic differences, with higher inflation and aggressive monetary responses. Finally, bond market participants used crude analysis techniques like regressions to value bonds, leaving them open to being arbitraged out of existence by quants who used fancy new analytics. But until the quants took over, the markets acted in an "inefficient" fashion. If you are a fixed income analyst and are bullish on bonds, expect to hear a lot about the 1994 rate hike cycle from your colleagues. 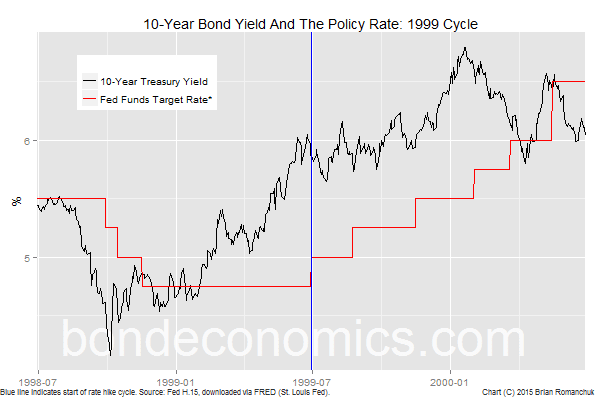 The chart above shows the 1-year span on either side of the first rate hike on 1994-02-04. Please note that the cycle lasted longer that this; see the chart at the beginning of this article for a longer view. I have standardised the time interval in the charts in this article to show what the beginning of the rate hike cycle looks like, without worrying about how each cycle ended. This economic cycle is when one should properly date the beginning of “secular stagnation” (for the United States at least). Although the Fed had cut rates to the “unsustainable, emergency” level of 3%, the United States economy was stuck in a now-familiar “jobless recovery”. The bond market (and policy makers) were caught flat-footed by a sudden acceleration in job growth. 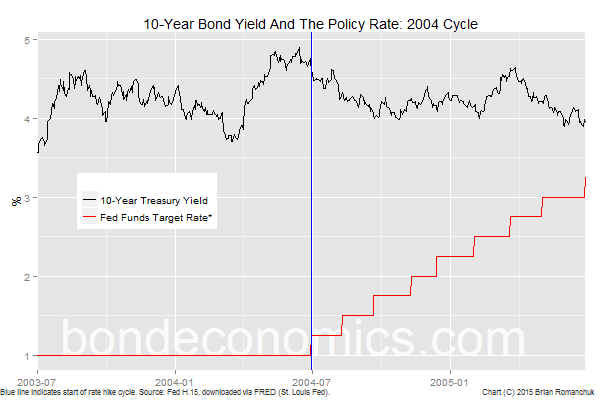 As a result, the bond bear market happened at the same time as the rise in policy rates. Many have mistakenly extrapolated that experience as being typical bond market behaviour. This contrasts to how the bond market reacted in the later cycles. Another difference between this cycle and the later ones is that rate hikes were in a somewhat random pattern, with pauses in between large hikes (up to 75 basis points). The consensus amongst developed country central bankers was a move towards “gradualism”: steady hikes of 25 basis points per meeting. But there is now discontent with gradualism, and Janet Yellen hinted she might want to have an interest rate path that is more like 1994. On top of the lagged reaction to the policy change, there was considerable speculation in interest rate derivatives. People wanted to enhance “too low” yields by embedding all kinds of crazy options into structured interest rate products. These all blew up at the same time, creating a feedback loop that accentuated the bear market. Bond bears love discussing this final point, hinting darkly that there are lots of speculators that are going to be cleaned out any minute now. My reaction is that this is overblown; this cycle caused everyone (investors, banks) to invest in fancy new risk management systems. Interest rate risk is the easiest risk to measure and hedge, and everyone keeps a close eye on it. The 1999 cycle is discussed less than the cycles on either side of it. The Fed hikes rates for the first time on 1999-06-30. To a certain extent, this cycle was just a continuation of a rate hike cycle that was going to start earlier. But in 1997, the Asian Crisis hit. Various Asian currencies collapsed, as did commodity prices. Asian manufacturers were desperate for cash flow, and so they dumped products on the buyer of the last resort – the U.S. consumer. This created a deflationary undertow that allowed the Fed to avoid starting a cycle of rate hikes in 1997. (There was a single hike in March 1997.) Then the hedge fund LTCM blew up in 1998. Since pretty much every other trading desk had many of the same trades in place as LTCM, there was a serious financial market fiasco (although it now appears quaint after 2008). As is its wont, the Fed cut rates in response. This was despite the fact that cuts were not warranted by the conditions in the domestic economy. The Fed was forced to tighten in 1999 when it was clear that the U.S. economy had strong momentum (the tech investment bubble was underway). The bond market reaction to this cycle has to be kept in context. The spike in yields below 4.5% in October 1998 was a short squeeze and a flight-to-quality.Therefore its reversal was not a surprise, and represents a distinct event from the later bear market. Once it was clear that the financial crisis was contained, the bond market started selling off, in tandem with the rise in the equity market. This bear market started around year end 1998 (before the first rate hike). During this era, bond yields and stock prices were positively correlated, and stock prices were following a strong bubble dynamic, which dragged along the bond market. 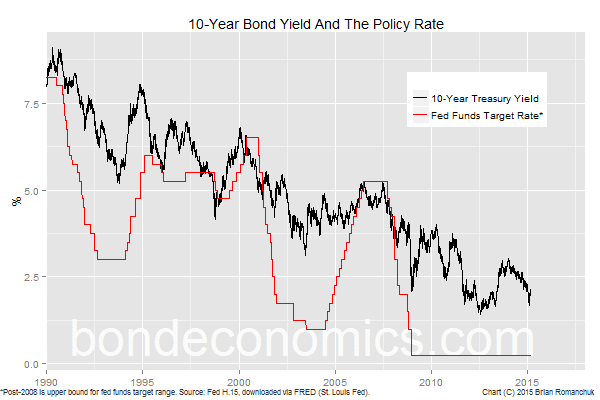 Although bond yields did lead the path of the policy rate, one could reasonably argue that bonds were more sensitive to the equity markets than whatever Fed policymakers were talking about. The Fed started a rate hike cycle on 2004-06-30. The 2004 cycle has been heavily analysed, so I will keep my comments brief. This is what you would expect if the Fed is transparent about its reaction function. At the time, there was considerable time wasted discussing “the conundrum”: why are bond yields not rising along with the policy rate? People who believed that there was a conundrum completely missed the fact that the selloff happened before the policy rate lift off. That debate shows the dangers of using outmoded analysis techniques like regressing the current levels of the policy rate and bond yields. You need to take into account how forwards react to changes in the outlook.